I'm almost a week late but Happy New Year everybody! I hope everyone enjoyed themselves, and here is my first look of the year! I usually try and steer away from using blues - especially mattes - as I always find they come out rather muddy looking when I blend them. So I decided to use just that today to see how it would turn out. It didn't turn out too bad, I still found it a lot more difficult to blend than any other colour, but I persevered and stuck with it. 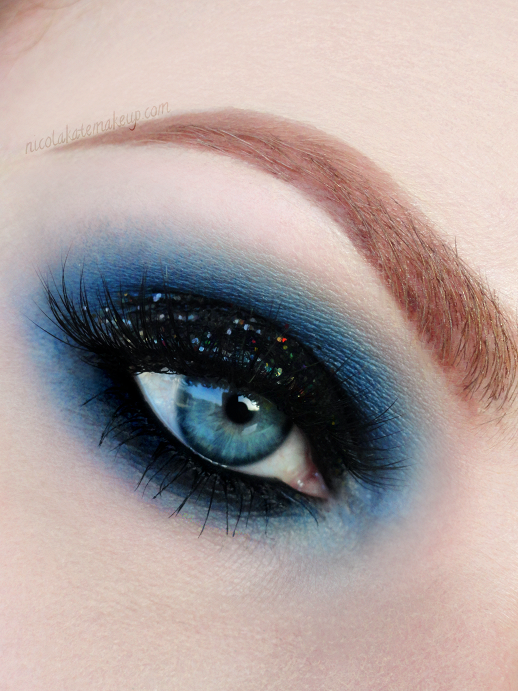 I've used this shadow from Concrete Minerals before but almost always in a way that didn't need to blended out. CM loose shadows are wonderful so I thought this one would be my best bet at getting a smoother application. I didn't want to do anything over complicated as I anticipated it coming out a big ol' mess, so I just teamed it up with a chunky black glitter and kept it simple. Let me know what you think. Are there any colours that you struggle to work with or are likely to avoid?